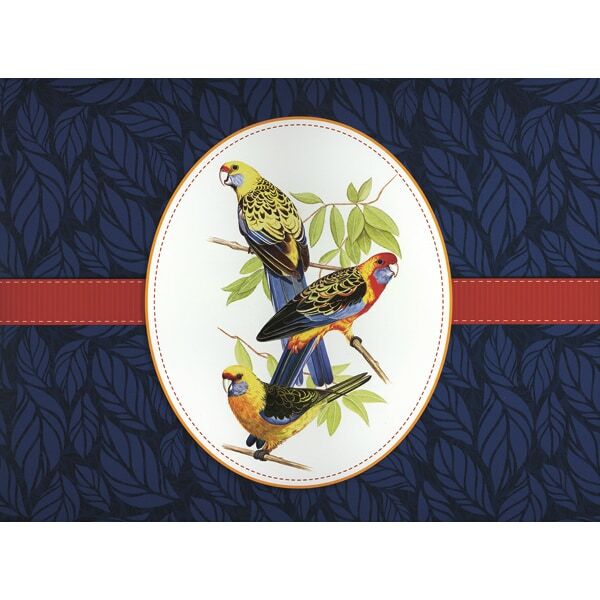 Presented in a blue and white keepsake box covered with bird illustrations, this assortment features 60 cards (30 each of two sizes) with envelopes. The smaller cards measure 4¾ inches square, decorated with five different Australian birds: azure kingfisher, Gouldian finch, superb fairy-wren, zebra finch, and little (fairy) penguin. The larger notecards are just under 5 × 7 inches, with five different images of several birds together. Five sheets of stickers offer message labels to apply to the cards ("happy birthday," "congratulations," "thank you," "have fun," and "bye! "), and the long, slim sheets in the hardcover memo pad measure about 4¾ × 1¾ inches, ideal for quick lists or bookmarks.